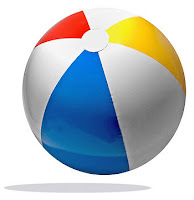 I worked all Memorial Day Weekend on new content for my Bay Head Blog, so today we're giving Roxiticus Desperate Housewives a rest and putting this blog up against the competition in BlogExplosion's Battle of the Blogs. While I was drinking my 4 o'clock beer (today it's La Cerveza del Pacifico Clara), we lost a close one 8-7 to Shallow Mike and his naughty strippers. For the Bay Head Blog's win in our second Battle, I'd like to thank all of you for your votes and thank my good blogosphere buddy Wally Banners and The WTF Blog for being a good sport. As always, whether you've joined us through EntreCard, SocialSpark, or BlogExplosion, we welcome your comments... please let us know what types of posts you'd like to see in the future here on the Bay Head Blog! If you have no idea what I'm talking about, please click the banner below to join the fun! One of our neighbors in Bay Head, Kate Leigh Cutler, is a fabulous artist. She did one painting of our girls several years back that I will post here soon, and has promised to have her newest painting of them complete when we return to the beach for Father's Day Weekend 2008. 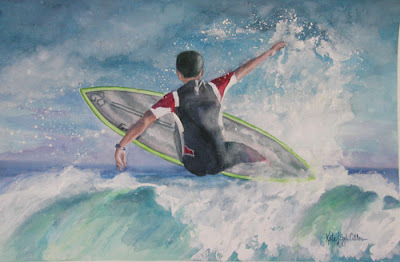 For now, I'll leave you with another Kate Leigh Cutler original painting of one of the neighbor boys surfing near Mount Street Beach in Bay Head, New Jersey. Rex and I close up our beach house in Bay Head, New Jersey, every year right after the annual Halloween Parade that starts on Mount Street, heads down Lake Avenue, turns left on Bridge Avenue, and proceeds into the fire station. By the end of October, all of the "bennies" are long gone, and the year-round Bay Head residents are left to enjoy the quiet tranquility of our beautiful beach town. Leading up to Christmas, the local Bay Head merchants' association puts on a special night of holiday shopping, when all of our favorite stores stay open late and create a festive Christmas shopping atmosphere throughout the town. Bay Head, New Jersey is not the type of place where people wake up at 5am on Black Friday (or sleep out in tents in front of the big box retailers) to stand in line for bargains. Especiallly off season, Bay Head is a sleepy little town where residents forego the thanksgiving ads from the big box retailers in favor of shopping at the old classic stores right in town... like the Jolly Tar or the stores in the Shopper's Wharf on Bridge Avenue, or head over to Mount Street to the Artisan's Galleria, maybe even commission a beautiful painting from local Bay Head artist Kate Leigh Cutler or find a special watercolor or oil painting by another Jersey Shore artist featured at the Anchor & Palette gallery in town. If my Bay Head neighbors are looking for a big-screen color TV or Playstation or Wii, I bet they either wait for Santa Claus to bring it down the chimney or they avoid the crowds at the mall and purchase Black Friday items online. 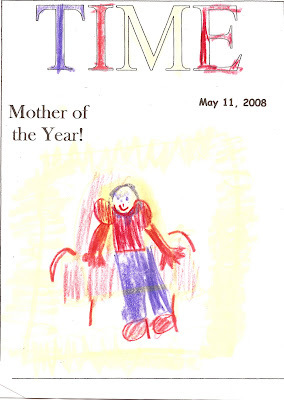 As I've posted once before, we're planning an August 2008 Bay Head family reunion for Rex's family. Everyone is pretty well confirmed, and they're all staying at The Grenville. I'm afraid we're stuck with the picture from their web site until I get back down to the peach with my good ole Canon Digital Rebel XT. Bay Head Mayor Bill Curtis (who is also the owner of Curtis' Central Market) informs me that the Borough of Bay Head will be running its summer camp again for the summer of 2008. The camp is a half-day (9-noon) program for residents age 5 and up and will run for six weeks starting July 7 (through August 15th). Information and registration forms are available from the Borough municipal office. The web site doesn't look like it gets updated very often, so you're probably better off checking in by phone: 732 892-0636. When it rains while we're down at our beach house in Bay Head, New Jersey, Rex and I like to take the girls shopping for clothes. 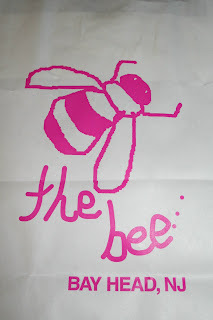 One of our favorite kids' clothing shops is Sarah's Kiddles in Pt. Pleasant Beach, NJ. We haven't been there so far this season since we haven't been "rained out," but the next rainy day will take us on a trip to Sarah's Kiddles, probably followed by dinner and Prince Caspian (the second movie in the Narnia series). Even though we've been down to our beach house a couple of times already this season, I couldn't tell from the road if Dennis Foy's Bay Point Prime would be open for dinner this summer. The good news is, I called their phone number and got the message that Bay Point Prime IS open, starting with Fridays, Saturdays and Sundays in the month of May. Hooray! I'm going to make reservations for Rex's birthday dinner at the end of June. Bay Point Prime is located right down the street from Bay Head at 1805 Ocean Avenue (aka Route 35), Pt. Pleasant Beach, New Jersey. Phone (732) 295-5400 for reservations. When we're at our beach house in Bay Head, New Jersey, Rex cooks a lot of seafood: clams, salmon, scallops, lobster...you name it and we get it from the Crab Shack. I may have mentioned before that my girls are Jedi Clam Eaters, and we'll buy 100 littlenecks and topnecks. Over the long Memorial Day Weekend, we had clams on Friday night and lobsters on Sunday night. I meant to take a picture of the Crab Shack for you, but for now we'll stick with a happy crab. If Rex is cooking seafood at home in Bay Head, the Crab Shack is the only place we'll go for fresh seafood. Open all year round, the Crab Shack has a large variety of fresh seafood daily, including live and steamed crabs, homemade specialties and prepared seafood dishes. If you don't feel like cooking, you can eat there, inside in the fish market or outside in the sunshine. Actually, that's not quite true. 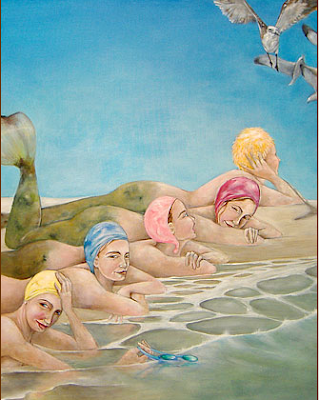 We purchased the Mermaid Swim Team, which is part of the Mermoments trilogy that Wendy McCarthy is working on for her show at the Anchor & Palette from July 25th through August 4th on Mount Street in Bay Head, NJ. We're planning to hang it in the girls' bedroom in our beach house for the summer, but since we probably won't be at the beach for a couple of weekends, we left it at the Anchor & Palette for you and our neighbors to enjoy. An extra special treat...we met artist Wendy McCarthy today...she was so pleased to be there when the first of her beautiful Mermoments paintings was sold. Wendy put a lot of love into the painting, but she could see we would give it a good home. Latitude 40º N features casual dining in a bright, welcoming and tranquil atmosphere. Executive Chef and Owner Randy Pietro, a Point Pleasant resident and Ocean County native, is a graduate of The Culinary Institute of America. 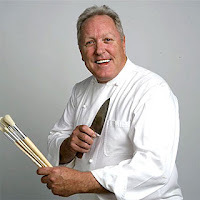 He brings many years of culinary expertise including 15 years as the executive chef at the famous Mickey Mantle's restaurant in New York City. Randy Pietro opened the doors to Latitude 40º N in July 2004. Since then, his mission has been to offer moderately priced, beautifully presented dishes, prepared using top quality ingredients and outstanding recipes that are both unique and traditional. While Rex and the girls and I tend to favor Dennis Foy's Bay Point Prime, ever since Dennis closed Dennis Foy's in Pt. Pleasant Beach, Latitude 40º N has been an attractive restaurant for expanding our options without driving too far from Bay Head. 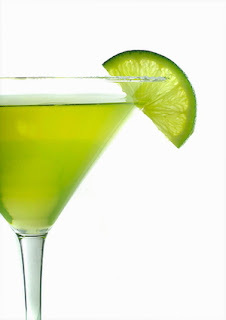 If you'd like to experience Latitude 40º N, I'd recommend calling ahead for reservations: 732-892-8553. Latitude 40º N is located in the heart of the Pt. Pleasant Beach downtown area, at 816 Arnold Avenue. 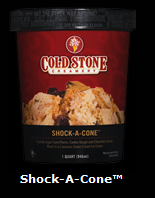 And save room for dessert. 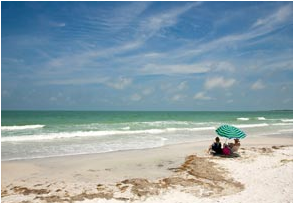 According to a recent story from CNN online, Florida's Caladesi Island topped the 2008 list of America's top beaches compiled by "Dr. Beach" -- Stephen P. Leatherman, a Florida International University professor. While our beloved Bay Head, New Jersey, didn't even make the list, Caladesi beat out beaches in Hawaii, along the Eastern Seaboard, and in California for this year's honor. The runners-up on Leatherman's list of best beaches this year were Hanalei Beach, Hawaii; Siesta Beach in Sarasota, Florida; Coopers Beach in Southampton, New York; Coronado Beach in San Diego; Main Beach in East Hampton, New York; Hamoa Beach, Hawaii; Cape Hatteras, North Carolina; Cape Florida State Park near Miami; and Beachwalker Park on Kiawah Island, South Carolina. Every year, usually early in the season to celebrate our return to the beach in Bay Head, New Jersey, we get together for dinner and drinks with the neighbors across the street. Rex cooks an amazing bunch of steaks, and Jango (with the bad influence on three minors assistance of his 10-year-old daughter and my two girls) makes pitcher after pitcher of margaritas. Tonight is that night, and we are really looking forward to it. After a nice bike ride in sunny Bay Head, New Jersey, Rex took the girls and me on a shopping trip to The W.A.S.P. on Bridge Avenue and The Bee (just moved to a new, bigger location) on Route 35. The girls made out like bandits at The W.A.S.P., picking out "twin" bathing suit sets as well as three or four new outfits each. Their mom didn't do too badly either...I found a nice white pinstripe suit at The W.A.S.P. and a hot midnight black and white wide strip tank dress at The Bee. We are ready to start stepping out for the summer season here in Bay Head, New Jersey. Labels: bay head nj, Bee, Best of Bay Head NJ, shopping, W.A.S.P. We're off to bike ride and hit the beach for the day, but I'll leave you with this watercolor that a local artist painted of our house in Bay Head, New Jersey. The girls have a new set of seashells painted and have already earned $3.50 (14 shells @ 25 cents each) selling seashells down by the seashore. Several of our neighbors at the beach in Bay Head, New Jersey, turned us on to the Mahogany Grille in Manasquan. While we can't walk there, the Mahogany Grille is worth the drive for a special occasion or, as Zagat's expresses it "when cost doesn't matter." 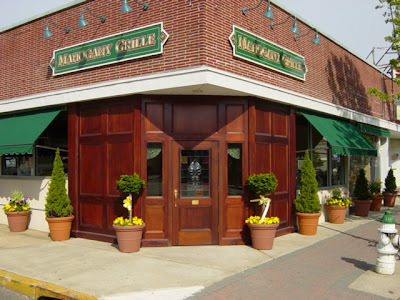 The Mahogany Grille is located at 142 Main Street (at Parker Avenue) in Manasquan, NJ. Call (732) 292-1300 for reservations. Apparently with the exception of this Wednesday with the Gin Blossoms, every Wednesday night is now Country Night at Jenk's! I may have to dust off my cowboy boots (custom-made just for Roxy in Texas) and cowboy hat and head on over to check out the live bands each week. Country Wednesdays are hosted by K98.5's Kaptain Jack and sponsored by Corona. I've been going to Martell's Tiki Bar on the boardwalk in Pt. Pleasant Beach, New Jersey, since I was in high school and had to use a 35-year-old woman's driver's license to get in, and it just gets better every year. Maybe ten years back, Martell's brought in some live palm trees (I believe they have to be replaced every year after the winter ravages them) to add to the tropical paradise of frozen drinks. Rex and I always go to see Southside Johnny & the Asbury Jukes at Martell's around Labor Day. Now that I've purchased my tickets online, I can reveal the dates – August 25th and August 26th – as well as a link for you to buy your own tickets. As I was taking these pictures, I ran into some guys who were working inside the restaurant, and they told me they hoped to have it ready by June 1st. With Rex's birthday and Father's Day in the month of June, we'll be sure to have a review for you by the end of the month. My girls have kicked off the seashell sales season here in Bay Head, New Jersey, with a new twist: Krylon spray acrylic will make this year's shells last longer. They haven't sold any so far today, but we're gearing up for a huge Memorial Day weekend....and we also found $2.50 (10 shell sales) in assorted change left on our porch on the honor system over the winter! 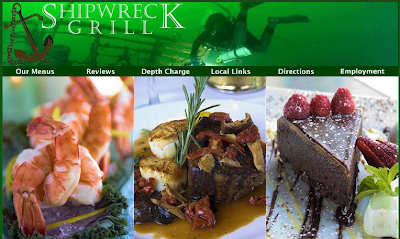 Rex and the girls and I are opening up the beach house tomorrow and we're having dinner at The Shipwreck Grill in Brielle on Saturday night!